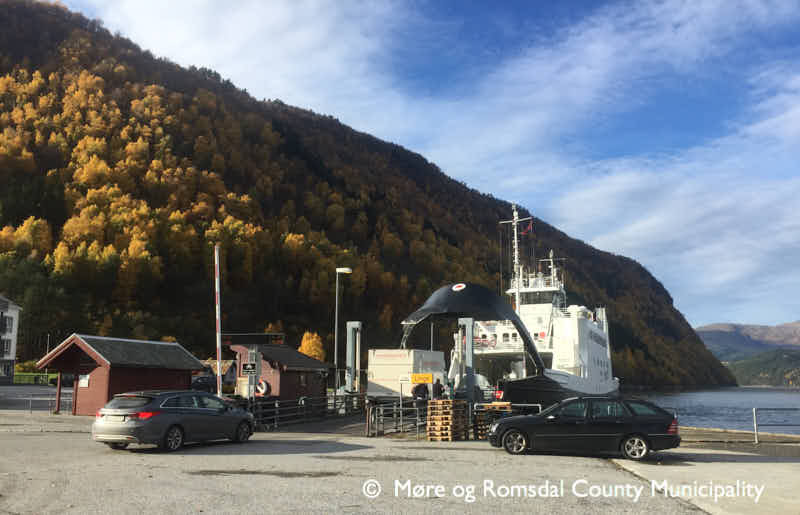 Møre og Romsdal county municipality has awarded a contract for the ferry connections Eidsdal-Linge, Stranda-Liabygda, Hundeidvik-Festøy and Sæbø-Leknes-Standal-Trandal to Fjord1. There was only one competitor: Norled. The contract for inner Sunnmøre will apply from 1 January 2020 until 31 December 2033. Works will be done to allow larger, new ferries on the Eidsdal-Linge route. New ferries are also expected for Stranda-Liabygda. The photo shows the quay in Eidsdal. 1,219 employees, 65 ferries and 4 passenger boats on 30 June. Start-up of the first fully electrical operation Anda – Lote. Start-up of two new connections in “Hordaland Rutepakke 1”. Fjord1 has signed several contracts for newbuildings: Cemre 2, Havyard 5, Tersan 1. + Despite investment in bridges and tunnels, Fjord1 believes that ferries will continue to be a vital part of the Norwegian road infrastructure for the foreseeable future. + The Group has stable contracts. In the first quarter Fjord1 had a total turnover of NOK 711 million, which is up compared to last year’s Q1 (NOK 628 million). Earnings before taxes totalled 138.5 million, a slight increase. (NOK 133 million). The result after tax is NOK 106.7 million, approximately 25 million less than last year, due to a higher tax bill. 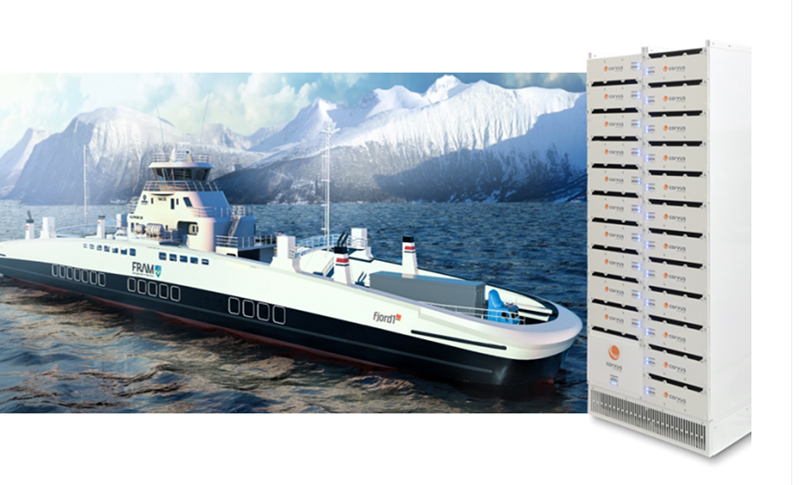 Corvus Energy has been selected by Norwegian Electric System (NES) to supply lithium ion battery-based energy storage systems (ESS) for two new all-electric ferries being built by Havyard for Fjord1. The ferries will operate on the Magerholm-Sykkylven route. This follows a previous order in November 2017 to supply the ESSs for three similar newbuilt Fjord1 ferries that will operate on the Hareid-Sulesund route. Fjord1 ASA can look back on a successful year 2017, and on an even more successful future. The company was able to sign several contracts for ferry routes. As a result several ferries are on order. The main focus is on environmental friendly solutions, with a mix of highly advanced zero- and low emission solutions. On 15 August 2017, Fjord1 was listed on Oslo Stock Exchange’s main list, at a market capitalisation of NOK 3.4 billion. Click on the cover to access a download link. Fjord1 has signed a contract for seven new ferries, on March 5. Five ferries will be built by Havyard Ship Technology, and two by the Cemre Shipyard in Turkey. The Havyard site belongs to the Fjord1 group of companies, with the Sævik family as major shareholder in both companies. Havyard also delivers the design. All ferries will be fully electric-powered. The five Norwegian-built vessels will serve the “Nordmørspakken” (Kvanne-Rykkjem, and Edøya-Sandvika), and “Hordaland 1” (Fedje-Sevrøy, and Langevåg-Buavåg). The two Turkish vessels will operate on Seivika-Tømmervåg. The seven ferries will be delivered to Fjord1 in the autumn 2019, since the new concession for the different routes starts on 1 January 2020. 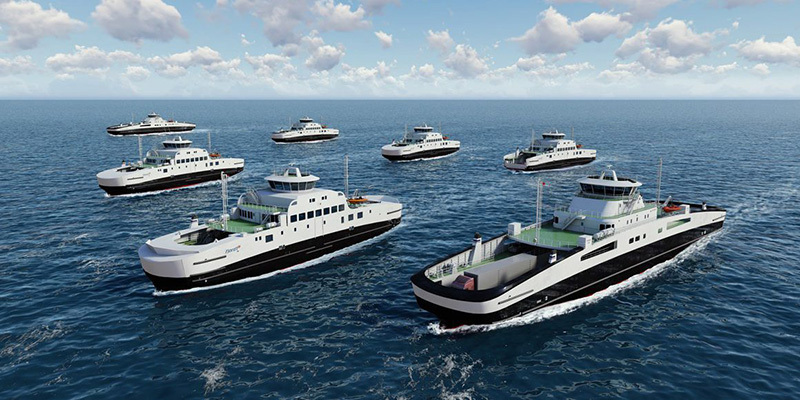 Fjord1 ASA ordered four Multi-Maritime designed battery ferries. Three of the ferries will be of the new “MM82FE EL” design, which is approx. 85 m long. The ferries will operate all electric on challenging routes. Two will operate at “Ranavik-Skjersholmane”, which is a 14.2 km long route and a service speed of approx. 13 knots. The expected charging power is up to 5000 kW. The third ferry will operate at Gjermundshamn-Årsnes. The three ferries will be built at Sefine Shipyard in Turkey (new buildings 33, 34 & 35) and delivered in Q3 and Q4 2019. The fourth ferry is 116m long and of “MM111FE EL” design. The vessel is planned to operate at Jondal-Tørvikbygd from 01.01.2020. The ferry will be built by Tersan Shipyard in Turkey and scheduled delivery is Q2 2019. Boreal Sjø ordered a Multi-Maritime-designed ferry too, of the “MM70FE EL” series. She will be built by Vard Brevik in Norway. The ferry will operate on the Kvanndal-Utne route. 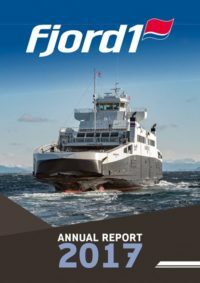 In the full year 2017 Fjord1 ASA has transported 21.1 million passengers and 10.4 million vehicles on 63 ferries. The revenue was NOK 2.8 billion. Two fully-battery-operated ferries were introduced, the GLOPPEFJORD and EIDSFJORD, both built by Tersan. In Q4, three ships were ordered at the Sefine Shipyard. The company will finalize the contracts for another seven new buildings during the first quarter of 2018.